We’re celebrating spring in many ways here at the Copley Society! On April 29th we are hosting our ArtWeek event, Florals and Fresh Paint, at the Four Seasons with an interactive bouquet demonstration from the experts at Winston Flowers. To get ready for the upcoming event we are revisiting the beautiful floral paintings that have been displayed at Co|So in the past year. From the 30th annual Fresh Paint last year Ellen Granter brought us this beautiful still life of a vase full of anemones and sweet peas. Painting mainly in oils, and sometimes incorporating gold leaf, Granter often paints birds, landscapes, boats, beaches, and, of course, beautiful floral arrangements. 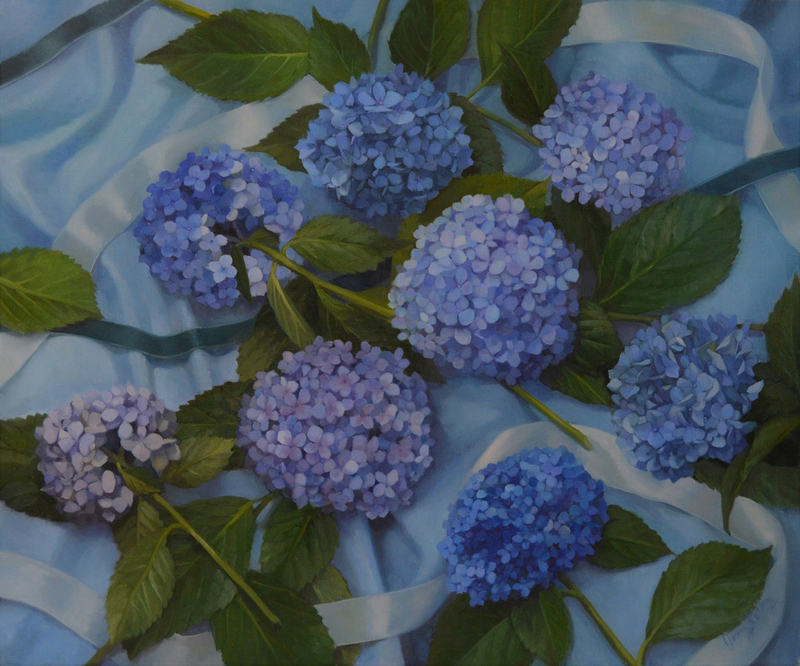 From the Members Show: In the Style of exhibition artist member Jenny Kelley brought us this Sir Lawrence Alma-Tadema-inspired painting of blue hydrangeas resting on a bed of blue ribbon. Kelley specializes in floral still lifes and she is passionate about painting from life observation. For Small Works: Ports of Call, contemporary impressionist painter, Rosalie Sidoti, exhibited this painterly depiction of a floral display in a blue and white vase. Inspired by the beauty light can create in the environment, the artist often incorporates filtered or splattered light resting on her subject matter. This colorful, fun-filled painting of a beautiful bouquet was a favorite from Small Works: In Full Color! Sue Dragoo Lembo’s knowledge of illustration and design from her schooling at Massachusetts College of Art and Design, also known as MassArt, have continued to heavily influence her realistic but whimsical paintings. Timothy Neill is inspired by vanitas, a 17th century art genre that contains symbols as reminders of the fragility of life. Through symbols and allegories Neill tries to incorporate the allusion to death and regrowth in his realist works. Regarding the meaning of this work, Neill quoted: “Love is a rose but you better not pick it; it only grows when it’s on the vine.” This oil painting is still on view and can be seen in our Lower Gallery until April 28th. Here’s a sneak peek into Fresh Paint 2019! Ann Marie O’Dowd created this painterly bouquet of lilies resting in a glass carafe atop a table for our Fresh Paint Gala. This painting steers away from her usual bright palette, but she still utilizes her trademark unique bold patterns.